In a long-awaited report, the department’s inspector general, Michael Horowitz, took Comey to task for a series of controversial steps he took during the investigation, including publicly exonerating Clinton in the midst of the campaign and then reopening — and later closing — the probe just as the November election was drawing near. The U.S. Justice Department's watchdog criticized former FBI Director James Comey for his handling of the Hillary Clinton email probe during the 2016 U.S. presidential election. Comey’s move to clear the Democratic candidate of any wrongdoing at a July 5, 2016, press conference, without informing the attorney general, “was extraordinary and insubordinate,” while his decision to send a letter to members of Congress on October 28, 2016, despite the attorney general’s opposition, informing them that he was reopening the investigation, constituted “a serious error of judgment,” the inspector general wrote. These and other missteps by Comey and other FBI and Justice Department officials damaged the FBI’s credibility, Horowitz concluded in his 500-page review of the investigation. The report took 18 months to complete. “While we did not find that these decisions were the result of political bias on Comey’s part, we nevertheless concluded that by departing so clearly and dramatically from FBI and department norms, the decisions negatively impacted the perception of the FBI and the department as fair administrators of justice,” Horowitz wrote. 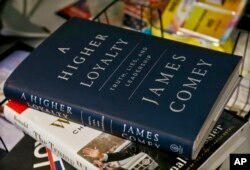 FILE - A copy of former FBI Director James Comey's new book, "A Higher Loyalty: Truth, Lies and Leadership," is on display, Apr. 13, 2018, in New York. In a recently released book, Comey wrote that he decided to do “something I could never imagine” in order to protect the bureau’s reputation after concluding that then-Attorney General Loretta Lynch “appeared politically compromised” by her association to the Clintons. “People of good faith can see an unprecedented situation,” he wrote. 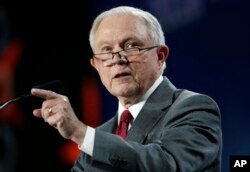 FILE - U.S. Attorney General Jeff Sessions makes a point during his speech at the Western Conservative Summit, June 8, 2018, in Denver. New leadership brought in by Trump-appointed FBI Director Christopher Wray is “one in which the American people can have confidence,” Sessions said. Speaking at a news conference at FBI headquarters, Wray said the bureau accepted the findings in the report but noted that it in no way “impugns the integrity” of the agency. “As I said earlier, fair and independent scrutiny is welcome and appropriate accountability is crucial. We’re going to learn from this report, and we’re going to be better and stronger as a result,” Wray said. Wray said the bureau has taken some steps, such as reassigning people and referring some cases to be reviewed by the FBI’s internal personnel department. He declined to comment on who might have been referred. He also said there was a new policy regarding contacts with reporters and news leaks. He said bureau staff would receive “intensive training” and it would be made “painfully” clear what the department’s new rules were. Deputy Attorney General Rod Rosenstein briefed President Donald Trump on the report Thursday morning before briefing members of Congress. Trump, who had praised Comey for relaunching the Clinton email probe on the eve of the election, last year cited Comey’s handling of the investigation when he abruptly fired him as FBI director. The president later said that he had the “Russia thing” in mind when he fired Comey. 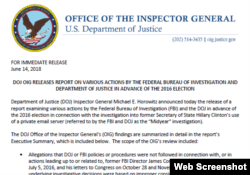 The inspector general expanded his investigation last year after discovering a series of anti-Trump and pro-Clinton text messages exchanged during the campaign between two senior FBI officials on the investigative team. The report said investigators found political text and instant messages exchanged by five FBI employees assigned to the Clinton email investigation team. The report said that while the messages “cast a cloud” over the FBI’s handling of “the investigation and the investigation’s credibility,” investigators found no evidence that their political bias “directly affected” the email probe. Both Strzok and Page briefly worked for special counsel Robert Mueller, who is investigating Russian interference in the election and alleged collusion with the Trump campaign. Mueller removed Strzok from his team last year after the disclosure of his text messages. Page later left the special counsel’s office. Trump and his Republican allies have seized on the text exchanges to allege that senior Justice Department and FBI leadership is biased against the president. The report gave both Republicans and Democrats political ammunition. Trey Gowdy, the Republican chairman of the House oversight and government reform committee, said he was “alarmed, angered and deeply disappointed” by the findings. The report confirms that the FBI decisions during the election “deviated from traditional investigative procedures in favor of a much more permissive and voluntary approach,” Gowdy said in a statement.